Our address is 122 Pipemakers Circle Suite 201, Pooler, GA 31322. Conveniently located just 20 minutes from the heart of Savannah, we’re 1.5 blocks off Pooler Parkway. From I-95 exit Pooler Parkway and drive West towards the new Tanger Outlet Mall. Turn Left at the Park Ave. stoplight (approx. 1/2 mile down) and make your first right at Canal St (behind Cancun Restaurant). You’ll then turn left onto Pipemakers Circle and drive until you arrive at the Pooler Park Business Center on your left. We’re units 200-201 in building 122 (look for the custom trucks). Answer: We are open Monday through Friday 9:00 AM to 6:00 PM and Saturday 10:00 AM to 2:00 PM. We also offer an early-bird service on an appointment basis only. Please call (912) 348-3652 to set up your early-bird appointment today. Answer: We specialize in accessories, performance parts, and wheels and tires for late-model trucks and cars. From lift kits to audio, exhaust kits to superchargers, and grille guards to ladder racks, we do it all. Stop by today and visit our world-class showroom to see how we can turn your custom vision into a reality. 4. 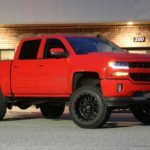 When I drop my truck or car off to have the new parts installed, can I wait for it or should I come back when it’s completed? Answer: Most installs will take several hours, with lift and lowering kits and superchargers taking a day or longer. Most often, we recommend dropping off your vehicle and we’ll contact you when it is completed, however if you would like to wait, we do have a customer lounge with complimentary WiFi, drinks, and even Blu-Ray movies for the kids. 5. 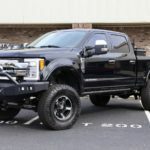 I just purchased a new truck and I want to lift it and make it look good, but I’m worried about the warranty? What options do I have? Answer: Good news, we work with most local dealerships and we actually provide modified trucks for them to sell. If you’re worried about your new truck’s warranty, the best thing to do is call your local service writer and see what their dealership’s policies are. 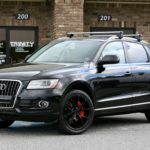 Also, most lift manufacturers now provide a bumper-to-bumper drivetrain warranty included when purchasing their products (and installed by an authorized/accredited facility such as Trinity Motorsports). With this extra warranty, you get peace of mind knowing you’ll enjoy years of worry-free driving. 6. I’ve already purchased parts and need someone to install them, is that possible? We absolutely can install your existing parts, however we do need more info from you. Primarily, we need to know exactly what kind of car/truck you have (ie: Year/Make/Model/Trim level/Engine size/2WD or 4WD/Mileage), what brand parts you have, and ideally, the exact part numbers you currently have. Trinity Motorsports is not responsible for previously purchased parts that are wrong or not meant for your vehicle. We reserve the right to refuse installation of inferior/cheap parts that you may have sourced from eBay or Craigslist. 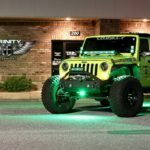 It’s also important to remember that Trinity Motorsports cannot provide a warranty for your previously purchased parts as we cannot verify purchase from an authorized distributor. 7. Do you require an appointment for part installation? Answer: Whereas it is not required when you purchase your parts, we do recommend setting an appointment. We make it a point to try and accommodate your schedule and we’ll work with you to get your car/truck looking and performing its best as quickly as possible. Give us a call today at (912) 348-3652 to talk about your custom ideas. 8. It is time for my routine maintenance, does Trinity Motorsports provide that type of service? Answer: We are not a discount oil change shop, however we can be your maintenance and full repair service center. Our highly trained technicians can handle most automotive repairs and we look forward to helping you keep your car or truck on the road for many miles to come. 9. I want to get the most out of the performance parts I have on my car/truck, do you offer custom ECU tuning? 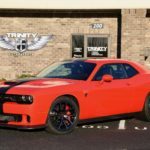 Answer: If you want the absolute best engine performance, throttle response, and quickest transmission shifts, Trinity Motorsports is your only destination. 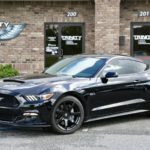 We provide in-house ECU tuning for all late-model GM cars and trucks and we can fine-tune a custom computer program for the new parts you are buying or for the parts you already have. We’re also Ford EcoBoost specialist and can turn your twin-turbo V-6 into a trailer-towing torque beast. Stop by today to discuss the upgrades you want and how we can help. 10. After I get a lift kit installed is there anything else I need to do? Answer: This question is one of the most important things you can ask to ensure you have a great experience with your new suspension. After we lift or lower any truck or car, we always perform a precise alignment so your ride with track straight, your tires will wear evenly, and the vehicle will handle its best. We also provide and require a free re-torque after 500 miles, just so we can double-check everything is like it should be. After that, we also provide free tire rotation every 3000 miles—this is vital to keep those new tires lasting thousands of miles. 11. My car/truck has a cloth interior and I’d really like leather instead, what options do I have? Answer: Good news, here at Trinity Motorsports we can turn your boring cloth interior into a high-class luxurious leather interior in just a day. We work with several top leather suppliers and we can even add custom colors, two-tone, and exotic materials to truly transform your car or truck.